If you think the main job of a sports memoir is to tell the athlete's story in his own voice, and that's a reasonable thesis, then you have to credit Jimmy Connors' book, The Outsider with accomplishing that. In the 416 pages of the book, the tennis fan is taken on a ride through the tumultuous post-Open era from the perspective of one of our sport's greatest players. One oddity of the book is the way Connors, in his direct quotes, seems to call everybody "son." Still, there are plenty of tidbits for the fan in the book. Connors discusses his struggle with OCD and his complicated relationship with his mother and grandmother. He also, very controversially, outs his former girlfriend, Chris Evert, for having had an abortion. Well, nobody ever accused Connors of being a gentleman. If I said that Connors' voice in the book, the public man, apparently, is crass, vulgar, self-centered, one of the most narcissistic divas of his time, easily rivaling that other self-impressed champion, Martina Navratilova, whose self-concern makes Beyonce seem like Mother Theresa, there would be no sense arguing about it. Connors admits as much and has no problem with it. In one passage, he says he didn't get the memo about not grabbing his crotch during matches. Okay … I guess? This is the world of sports, and when you deliver the goods, eight Grand Slam singles titles, it proves what Connors says his grandmother told him, "You can get away with anything if you win." Reading The Outsider is like listening to the Nixon tapes in that the principal is paranoid, obsessed, has a narrow view of the world and an extreme us-versus-them mentality, though the former president never had a run like Connors did at the 1991 U.S. Open. From Connors' perspective, all of this vitriol is justified by his back-story about being a battler from the wrong side of tracks, first from East St. Louis, Ill., then Belleville, Ill. The East St. Louis part of the myth is important because it really is a poor town. Belleville, while no Beverly Hills, isn't. Connors takes care to point out that the tennis court in the backyard of his family's house in Belleville was homemade. He also mentions that it was only put in so his mother could give lessons to supplement the family's income. There is a picture of the teenage Connors playing on that court. The center line and the service line look faint. Apparently, that just motivated Connors to beat all the rich kids whose backyard courts had lines on them that stood out. If you remember or have studied the arcana of men's pro tennis in the 1970s and 1980s, Connors' take on the personalities of his era will be engaging. Who knew that Jimmy Arias acted badly in the overall debacle that was the 1984 U.S.-Sweden Davis Cup tie? And, again, Connors stays in his public character, or caricature, as he takes swipes at nearly everybody who crossed his path. There's no making nice with John McEnroe. Brad Gilbert gets a beat down from the author (it isn't clear who wrote The Outsider, as David Hirshey is credited as the editor), tennis executive Ray Benton and former ATP tour umpire Jeremy Shales all are dissed. Andre Agassi takes a nasty drubbing as well. Agassi can defend himself, but I have to object to the portrait of British umpire Jeremy Shales. The ATP hired Shales to try to control Connors and McEnroe in the 1980s. When he did his job, in part by defaulting Connors at the Miami event in 1986, the tour fired him. The tennis personality who must be a saint to have escaped the wrath of Connors is Andy Roddick, whom he coached for over a year. Illie Nastase and Vitas Gerulaitis also don't get any criticism, but you can understand why they escaped being placed on Connors' enemies list. What we get in The Outsider is the public record of Connors, the public man. If you are a Connors fan, you'll enjoy the book. Jimmy Connors' antics and performances touched a lot of people in a positive way. He won 10 Grand Slams counting doubles. He is the only man to win the U.S. Open on all three surfaces. Connors invented his “outsider” ethos, and he certainly hasn’t wavered in living up to it. You have to give credit where credit is due. If all of those Caesars Palace "winner take all" matches weren't really "winner take all," screw the newspapers who made a fuss about it. The portrait of the champion that emerges from The Outsider isn't going to be everyone's cup of tea. Still, you have to admire, with reservations, the lion in winter who is still snarling after all his hip replacements. 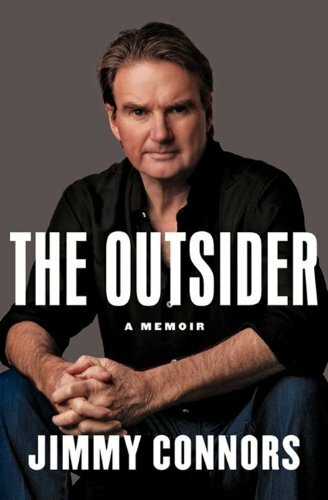 The Outsider is well worth reading if you are a Jimmy Connors fan. They cannot take that away from you, son. Long Island tennis coach Salomon Levy Bromet's guide to playing tennis is a well-designed booklet that uses a series of visual analogies to guide players to better performance. With clear images and pithy text, Salomon compares each shot to activities in other areas. For example, the volley is compared to catching butterflies with the racquet as the net. The kick serve is likened to hitting the ball up and over a wall. Salomon has given players a well-designed work that can be absorbed without reading a great deal of text. The visuals do the job, leaving more time for on-court practice. To order this book you can contact Salomon directly at zenmaster18@hotmail.com or you can find it on iTunes.